Test takers often ask how to improve reading skills in IELTS. Well, the answer is that there are no shortcuts or secret techniques to improve IELTS reading band score. You can improve your reading by consistent practice, improving your vocabulary for IELTS reading, time management and by taking professional help from a certified IELTS trainer. So if your question is how to improve IELTS reading, continue to read further. Everyone has a different reading style or different level of reading skills. Some find it interesting to read the text in various books, magazines, articles or journals whereas others may find it boring or difficult to maintain concentration while reading passages. It is imperative for the IELTS test takers to develop the habit of reading and also develop the interest in reading from various resources so that they don’t face difficulty on the actual exam day in the reading tests. A consistent effort along with the guidance of a certified IELTS tutor can definitely help to improve your score in the IELTS test. The following IELTS reading improvement tips can help you improve your score in IELTS reading sections of both General Training and Academic modules. Before we get to the tips and techniques to crack the IELTS reading section, it is critical to understand the importance of building reading skills. Just like sportsmen work on their stamina along with the actual techniques of that particular score, IELTS test takers should practice reading through various resources. Once you become comfortable with familiar with reading, it becomes easier to read the text in the IELTS exam and helps in answering the questions. It can be stressful for many test takers to read and answer the questions in a time bound test scenario so a lot of IELTS reading practice tests should be attempted to be familiar with the actual test scenario. Both the IELTS General Training reading section has 3 sections and 40 questions. IELTS General Training reading has four short passages and one long passage whereas IELTS Academic reading section as three long passages. The techniques to approach and answering the questions, however, remains the same. The language in IELTS General Training reading may be simple as compared to the IELTS Academic reading. The first section of the IELTS General Training reading deals with the “social survivor” and reading passages are also designed accordingly containing notices, brochures, instruction manuals advertisements etc. The second section of IELTS General Training reading contains text relating to “workplace survivor” like the description of jobs, interview techniques contracts etc. Many test takers start to read the text in the test and read each and every word in the passage and waste time. This is not the right approach to begin with. You need to improve your reading skills by practising techniques like skimming, where you just read to get an overview and don’t read the entire passage. You need to have an overview and focus on main areas and mark keywords while skimming through. Then you solve the IELTS reading questions by scanning – which is reading with a specific purpose. In this way, you can find correct answers in less time. Students who read each and every word in the text are often unable to solve all the 40 questions of the test. It may seem difficult in the beginning but when you get used to it, this will help to improve your score in IELTS reading. It is recommended to practice various question types which are asked in the IELTS reading test. You can improve your score by knowing your strengths and weaknesses by doing IELTS mock tests and identifying the question types which you find difficult to solve. A wide range of questions are asked in the IELTS reading exam: Fill in the blanks questions can be in the form of – sentence completion, summary completion, note completion, table completion, flowchart completion, diagram label completion. Other types are – MCQ’s and short answer questions. Students generally find it difficult to answer questions like TRUE – FALSE – NOT GIVEN or YES – NO – NOT GIVEN in the form of identifying information or identifying writer’s views/claims and in matching headings or matching the information type questions. It is a good idea to take IELTS coaching from an IELTS expert to improve your score in IELTS reading. You need to practice a lot of IELTS mock tests for reading to be familiar with various question types. The Cambridge IELTS books have authentic tests and have a good repository of a variety of questions. These can be effectively used for the preparation of IELTS reading section. Lexical resources is an assessment criterion in the IELTS writing but a test taker’s range of vocabulary is assessed in the reading section in an indirect way. Many reading questions can be answered only if the vocabulary is really strong. It cannot be developed in a short period of time so efforts should be made to enhance these resources. If you want to improve your score, you need to practice reading through a variety of resources and keep noting down the uncommon words that you come across. Additionally, make efforts to check the synonyms and antonyms of those words. This will slowly but surely help to enhance the vocabulary. It will become easier to find correct answers in this way. The reading sections is of 60 minutes and there is no extra transfer time to transfer the answers. So answers should be simultaneously transferred to the answer sheet. In the computer-based test, this is done side by side so the test takers are not much concerned here for the loss of time. You are expected to read more than 2200 words in a typical IELTS reading test which takes a lot of time and effort. So, the techniques of skimming and scanning become useful along with the marking of keywords. You must also keep an eye on the time left while doing the reading section. If you take any break in the test for going to the bathroom, no extra time will be allotted for that. Also, you can block the time for each section while practising. You can get a fair idea of how much time you generally take in each section when you do the IELTS practice tests before the exam. Do remember to revise the work done in the end. All of us do mistakes in the actual exam scenario so time should be allocated to check the answers in the end so that it doesn’t add to the pressure. It is important to read the instructions carefully to write the correct answers. Check the limit of words mentioned for the fill in the blanks or short answer questions to avoid any unnecessary mistakes. The grammatical accuracy of the answers is another key point to take care of. If the spellings of the answer is wrong then the answer would be automatically wrong. Care should be taken to write the answers clearly so that the IELTS examiner can easily read them. 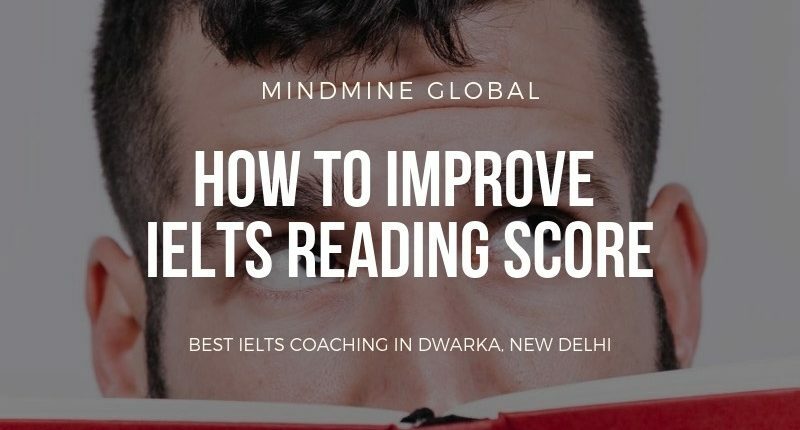 It is highly recommended that the test takers should join the best IELTS coaching in Dwarka or the best IELTS coaching in Delhi to improve the IELTS reading score from 6 to 7.5 or 8 or 9 bands. A certified faculty for IELTS can help to achieve and improve your score in IELTS reading in an effective and professional manner. They are experienced and understand the strength and weakness of the students and provide effective IELTS training. Doing free online coaching for IELTS from unknown sources or from unofficial resources can be a waste of time and energy. Mindmine Global by Mindmine Academy Private Limited provides the best IELTS Coaching in Dwarka Sector 7 and Delhi NCR. It offers both classroom and online coaching with flexible timings. Many students from outside Delhi and also from outside India take online IELTS coaching to improve their band scores. A vast number of students have scored more than CLB9 in IELTS General Training and more than 7 Bands in IELTS Academic module with the help of trainers who are certified by British Council and IDP.